In Brief: Hike up to our campsite on the wall and spend the night in tents. The next day, hike over to Jiankou via the Chinese Knot. On this trip you'll carry all your own gear, food, and water. Setting up camp on the the Great Wall Spur. On this two-day back-to-basics camping trip you’ll explore the ‘wild’ Great Wall, camping overnight on the Great Wall Spur and hiking over to Jiankou via the Chinese Knot on the second day. Group size 6–10 hikers. You’ll be carrying at least 8–10 kilograms of gear in your pack. If you’d prefer a less strenuous camping trip, consider one of those where we organise delivery of equipment to the campsite. We’ll have a fairly good idea of the weather by about three days before the hike. If it’s forecast to be dangerous or no fun – i.e. thunder and lightning, or heavy rain – we’d need to change to a different hiking location or call off the trip. 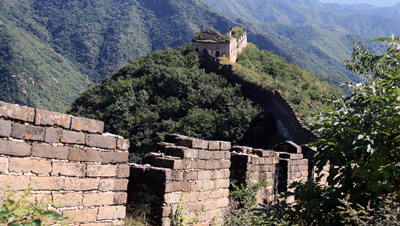 Our base camp will be on the wall near a solid tower near the end of a line of unrestored Great Wall, up on a ridge. 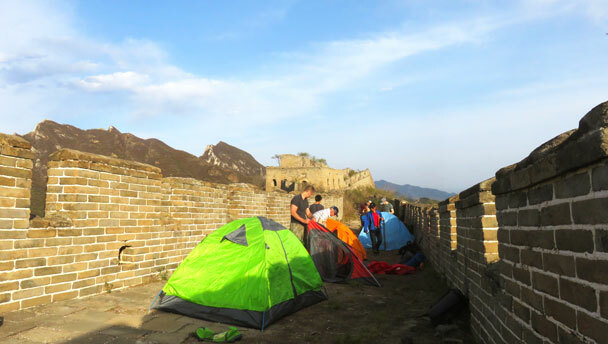 We’ll have broad views to the west, north, and east, and you’ll be able to see the sun rise over part of the Jiankou Great Wall at about by poking your head out of your tent at around about 4:49am. The sun will set just before 7:34pm, and we’ll be able to watch as the sun slowly sinks below a tall ridge of mountains. Moon phase: new moon, good for stargazing. Lunch, day one: We’ll supply a big sandwich, as well as a banana and a Snickers bar. You might like to supplement this with extra snacks. Dinner: We’ll supply you a gas burner, a pot, plus some pot noodles. The rest of the menu is up to you – perhaps a nice wine to pair with the noodles? – but bear in mind you’ll have to carry all your ingredients up to the wall, and carry the remains away the next day. Breakfast: We’ll include two croissants for you, plus tea and coffee. Again, if you’d like more, feel free to bring more. Water: We’ll provide 4 litres of bottled water per person. We supply: one tent for each person, sleeping bag and liner, ground pad, hiking poles. Do you have your own camping gear? Let us know, and we’ll adjust the price for you. And let us know if you’d like to share a tent to cut down on what you need to carry. Bring your personal supplies and food along to the meeting point in the morning. We’ll give you a 50-litre pack to use for the hike, and you’ll transfer your things into that. Things that you don’t need for camping can be left on the bus. We’ll see the bus again after we finish the hike on the second day. The hike begins with a short walk up a valley road, followed by a climb up a hillside path to reach the Great Wall. The climb is fairly steep in places, and we’ll take our time. As we get higher up we’ll have superb views of the Great Wall running along a ridge. We’ll eventually get up on to the wall and set up our campsite on a nice flat area between the battlements. Close by is a large tower. After setting up camp we’ll have time to explore the wall – take a little look further down the ‘spur’ section, or head further up towards a high point. We’ll return to the campsite before it gets dark, cook dinner, and settle in for the evening. On the second day of the trip, we’ll pack up the tents, fill up with some water, and hike back up to the high point we saw the previous day. Just before we reach that highest point we’ll turn off onto another section of wall and follow it down into a valley. The section of the wall that leads down into the valley is a fairly tricky walk – the wall is not in good condition, and it’s rocky and slippery. We’ll take it slow heading down here, and regroup just before where the wall starts heading uphill again. From there, we’ll follow the wall all the way up and over the mountain. There’s a particularly difficult part along the way where we’ll have to jump off the wall and scramble our way through trees up a steep dirt path to avoid a broken section. Depending on what you like in a hike, this is either a fun scramble, or an arduous climb. You’ll need to use your hands to pull yourself up a few steep bits, and the trail is slippery in places. Soon after that we’ll reach the peak at around 1,000 metres above sea level. After a rest, snacks, and the opportunity for some good photos we’ll continue along the wall, heading down towards the valley that will lead us down toward a small village where we’ll find our bus. Holiday traffic: this weekend is a big holiday, and we might get stuck in traffic going there or coming back. Bring a book or other entertainment, just in case! There are some steep sections on this hike, and in one place in particular you’ll need to pull yourself over rocks and between trees on a steep hill trail. You’ll be carrying at least 8–10 kilograms of gear in your pack. Photos from a self-supported camping trip on the Great Wall.